Continuing our look at Britain’s pioneering 1960s car ferries, in this ‘Blast from the past’, attention falls on the B&I Line and their new ‘Motorway’ service between Liverpool and Dublin, introduced with the arrival of the new Munster in 1968. B&I Line was purchased by the Irish government in February 1965 from the Coast Lines group, their primary interest being to ensure that the key ferry routes to the Republic of Ireland did not continue to fall behind in the evolution of vehicle ferry services – although British Rail had introduced their car ferry Holyhead Ferry I in 1965, most sailings to the country remained in the hands of rather traditional passenger ships. The urgency of the situation meant that the Munster and her two later fleetmates were based on an ‘off the shelf’ design, namely the Lion Ferry trio the Prins Bertil, Gustav Vasa and Kronprins Carl Gustav, delivered between 1964 and 1966, particularly the latter ship with which the Munster shared the distinction across the six vessels of not having the sky bar aft of the bridge. The later two B&I vessels, the slightly larger Innisfallen and Leinster of 1969, had this feature restored, the Leinster being the only vessel of the six not to be delivered by Werft Nobiskrug in Rendsberg, West Germany – for her, construction was brought ‘home’ to the Verolme shipyard in Cork. 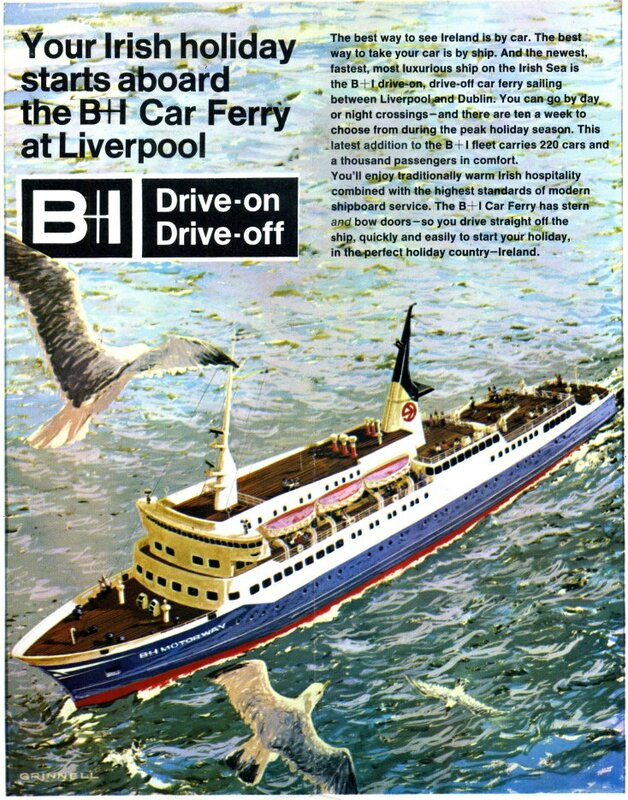 The name of the first of the new ships had evidently not been settled upon at the time this piece of publicity was produced, the vessel depicted bearing the name ‘B+I Motorway’. The artist's impression of the new ship exaggerated the sleekness of her lines somewhat compared to the reality (below), also giving an indication of teak decking against the painted steel of the finished vessel. The white flashes on the bow, a signature of the ship's designer, Tage Wandborg of KEH, appeared on the Lion Ferry sisters, but not, in the event, on B&I's ships. The Munster was, inevitably, a one class ship, sweeping away the old two class system of the traditional passenger vessels. 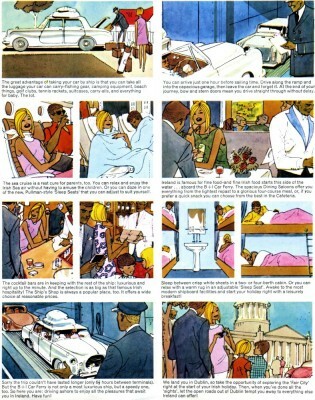 On board, the uppermost Boat Deck featured a cocktail bar (“fully carpeted” no less) with adjacent restaurant together with a lounge filled with the “new, Pullman-style ‘Sleep Seats’ that you can adjust to suit yourself”. The Promenade Deck, below, included a large cafeteria and lounge, forward, with seats for more than 270 passengers together with a verandah lounge aft and a smaller bar for 50 passengers. Throughout, the interiors were fresh and modern although, for an overnight ship, there was a somewhat primitive approach to passenger cabins with berths for 248 passengers being accommodated in two- and four-berth rooms across two decks in the space forward of the engine room, beneath the car deck. None of the cabins were equipped with en-suite facilities (something corrected in the subsequent pair, giving further credence to suspicions that, in haste, the first vessel was accepted “as is”, before any significant modifications could be made to the original design). The use of the ‘Motorway’ terminology is interesting – the back cover of the brochure advises would-be passengers to “take the M6 to Liverpool – and the B+I Motorway to Ireland”, tying the clean-cut modernity of the new ships to the then still youthful and popular motorway network which was springing up around the country. The ships even adopted a blue and white livery, not obviously linked to their operator or to Ireland, but which reflected the colours of the Kinneir-Calvert UK motorway signage system. By 1968 the M6 stretched from Bescot (near Walsall in the West Midlands) to north of Lancaster, providing good access to the region from North and South. The heroic trans-Pennine M62 towards Liverpool was not however completed until 1976, and for many motorists after exiting the M6 there followed a rather tortuous route along the East Lancs Road or the A57, then through the city to the new, but short-lived B&I terminal at Carriers Dock near Bootle (a further new terminal, nearer to the city centre, was built at Waterloo Dock in 1972). Interestingly, the timetable insert to the main brochure notes that “In addition to the Car Ferry, the [passenger ferry] m.v. Munster or the m.v. Leinster will operate a two class tri-weekly sailing between Dublin (North Wall) and Liverpool (Princes Dock East).” A separate brochure, distinctly different in tone to that for the glamorous new car ferry, was produced for this service. Evidently decisions had still to be taken as to which of the venerable passenger ships would perform this duty but, in the event, it was the Leinster of 1948 which undertook the sailings, remaining in operation until the second car ferry, the Innisfallen, arrived in July the following year. 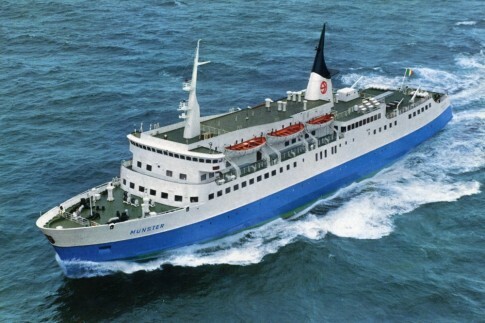 The old Munster (briefly renamed the Munster I) was sold to Epirotiki even before her namesake car ferry was delivered and went on to enjoy more than 30 years further service as a cruise ship – the famed Orpheus – in which capacity she was only barely outlived by the car ferries which replaced her, all of which were scrapped in the early years after the turn of the century.